MICHAEL NOONAN has said Ireland will be able to raise funds independently of the Troika and escape its bailout – even if it cannot secure a deal to recover some of its costs in saving the banking sector. Noonan is joining his counterparts from the other EU member states for two days of talks in Luxembourg, where ministers are expected to formulate new rules governing who should have to foot the bill if a Eurozone banks needs saving in the future. The talks are also due to discuss draft proposals on how the Eurozone’s new bailout fund, the ESM, will be used to save ailing banks – and whether it can be used retrospectively in Ireland’s case to recover some of the €64.1 billion that Irish taxpayers have spent on their own banks. Of that investment, €34.7 billion was invested in Anglo and Irish Nationwide – which are now being liquidated in their combined IBRC format – but the remaining €29.4 billion could still be recouped, if Ireland is able to convince other Eurozone members that the ESM should work retrospectively. 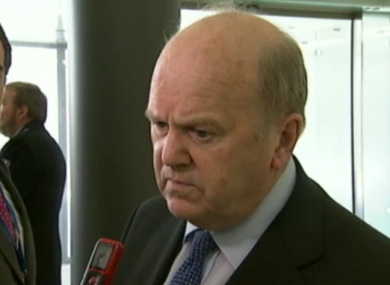 This afternoon, on his way into the talks in Brussels, Noonan said Ireland’s recent financial activity – including the liquidation of IBRC and the tearing up of the promissory notes – had assured the world that “the Irish debt position is sustainable”. However, Noonan remained upbeat about the possibility of being able to secure funding from the ESM – which would effectively buy Ireland’s stake in the banks, acting as if it had been in place in 2009 and 2010 when the banks first needed help from the taxpayer. “We’ve always argued that Ireland is an exceptional case,” he said. We’re not arguing this case for all our colleagues in the Eurozone. We’re arguing this case for Ireland. We’re saying, in effect, we were forced into a position by the ECB where we weren’t allowed [to] ‘bail in’ senior bondholders. If the ESM rules that are now emerging were in place two years ago, when we recapitalised the banks, the ESM would have assisted the recapitalisation. That’s our case for retrospective application. Asked about the comments of his German counterpart Wolfgang Schauble, who had told reporters he had “little leeway” to use the ESM for retrospective funding, Noonan said he interpreted this positively. Tomorrow’s meeting is expected to sign off on a revised schedule for Ireland to repay the European parts of its bailout loans, giving Ireland an average of seven years more to repay each loan. Email “Noonan: Ireland will escape bailout, even if we can't recover bank costs”. Feedback on “Noonan: Ireland will escape bailout, even if we can't recover bank costs”.